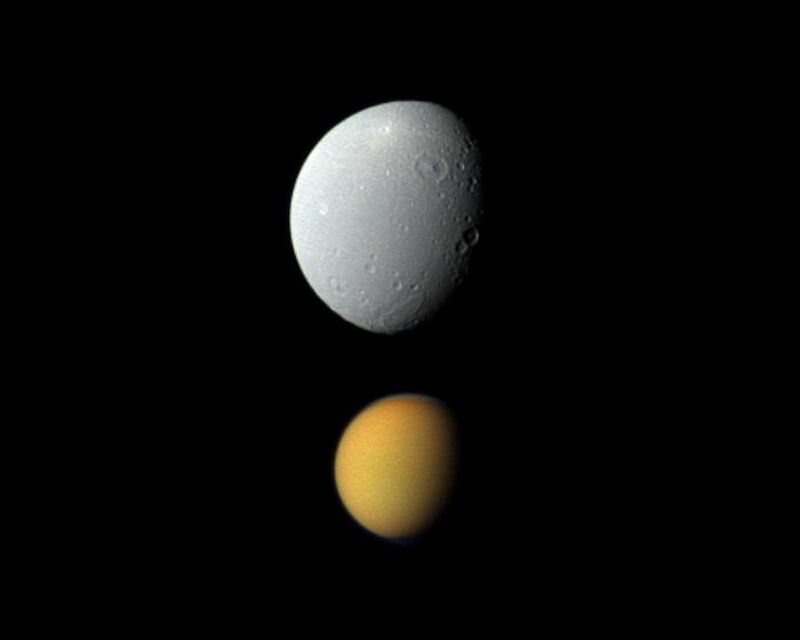 Saturn's largest moon, Titan, appears deceptively small paired here with Dione, Saturn's fourth-largest moon, in this view from NASA's Cassini spacecraft. Titan (3,200 miles or 5,150 kilometers across) is much farther from the spacecraft than Dione (698 miles or 1,123 kilometers across) is in this view. The view was captured at a distance of approximately 684,000 miles (1.1 million kilometers) from Titan but only about 85,000 miles (136,000 kilometers) from Dione. 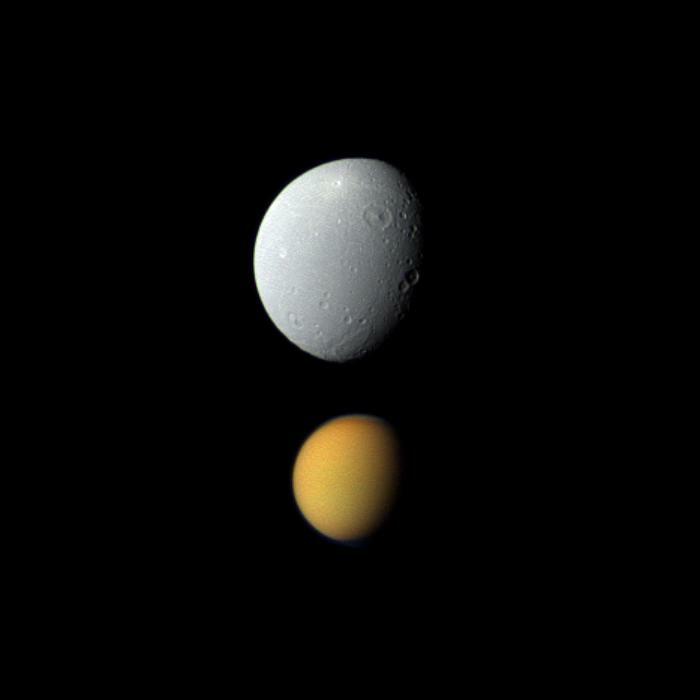 Titan appears in true color but has been brightened by a factor of about 1.6 relative to Dione. This view looks toward the Saturn-facing side of Titan and the area between the Saturn-facing side and leading hemisphere of Dione. North is up on the moons. Images taken using red, green and blue spectral filters were combined to create this natural color view. The images were obtained with the Cassini spacecraft wide-angle camera on Nov. 6, 2011. 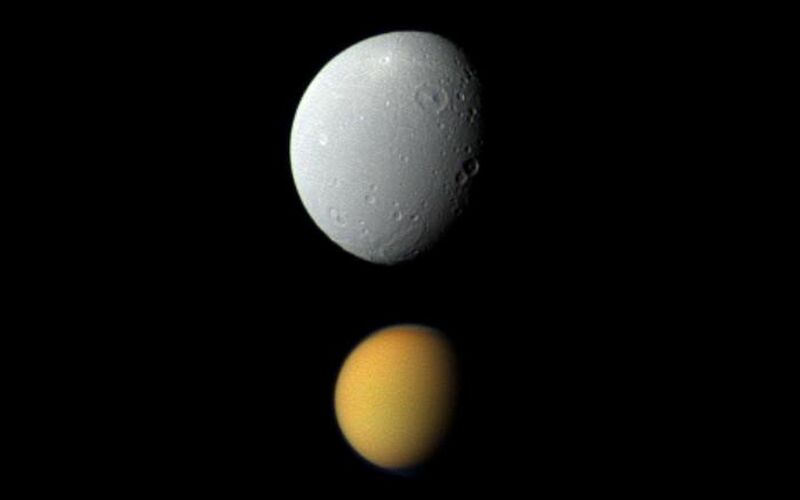 Scale in the original image was 5 miles (8 kilometers) per pixel on Dione and 41 miles (66 kilometers) per pixel on Titan. The image has been magnified by a factor of 1.5 and contrast-enhanced to aid visibility. The Cassini-Huygens mission is a cooperative project of NASA, the European Space Agency and the Italian Space Agency. The Jet Propulsion Laboratory, a division of the California Institute of Technology in Pasadena, manages the Cassini-Huygens mission for NASA's Science Mission Directorate, Washington. The Cassini orbiter and its two onboard cameras were designed, developed and assembled at JPL. The imaging team is based at the Space Science Institute in Boulder, Colo.
For more information about the Cassini-Huygens mission, visit http://www.nasa.gov/cassini and http://saturn.jpl.nasa.gov.